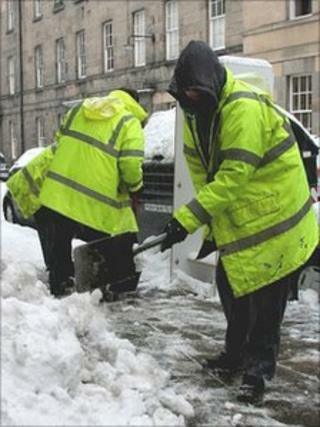 More than 1,450 hours of snow clearing was carried out by offenders on community service orders in Edinburgh during the recent severe weather. Edinburgh City Council said areas which benefited from the work included care homes, day centres, sheltered housing, medical centres and bus shelters. The figures came from the city's criminal justice service, which runs the community service programme. The work was carried out by more than 100 offenders between 2-22 December. Paul Edie, Edinburgh City Council's health and social care leader, said: "The city has experienced its worst snowfall for over 40 years and the council had to use all the resources at its disposal to keep essential services open. "The whole purpose of community service is that offenders repay the community for their crimes and that's exactly what they have been doing over the past three weeks. "We took them off their routine duties and identified priority areas outside care homes, medical and social work centres and homes of our most vulnerable people. "The work of these offenders has benefited the city enormously. "They are a valuable resource which we won't hesitate to use again."